The Community Access Program (CAP) is a Government of Canada initiative, administered by Industry Canada, which aims to provide Canadians with affordable public access to the Internet and the skills they need to use it effectively. With the combined efforts of the federal, provincial and territorial governments, community groups, social agencies, libraries, schools, volunteer groups and the business community, CAP helps Canadians, wherever they live, take advantage of emerging opportunities in the new global knowledge-based economy. 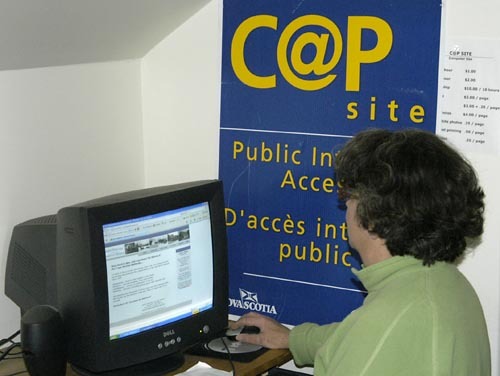 Under CAP, public locations like schools, libraries and community centres act as “on-ramps” to the Information Highway, and provide computer support and training. The government is no longer providing services as mentioned above, but our organization continues to offer the service. Other Times of Year: by appointment. Call 902-383-2579. A modest fee is charged for C@P site use.